PSI has apparently been manually uninstalled and now I'm unable to get it to reinstall the program. 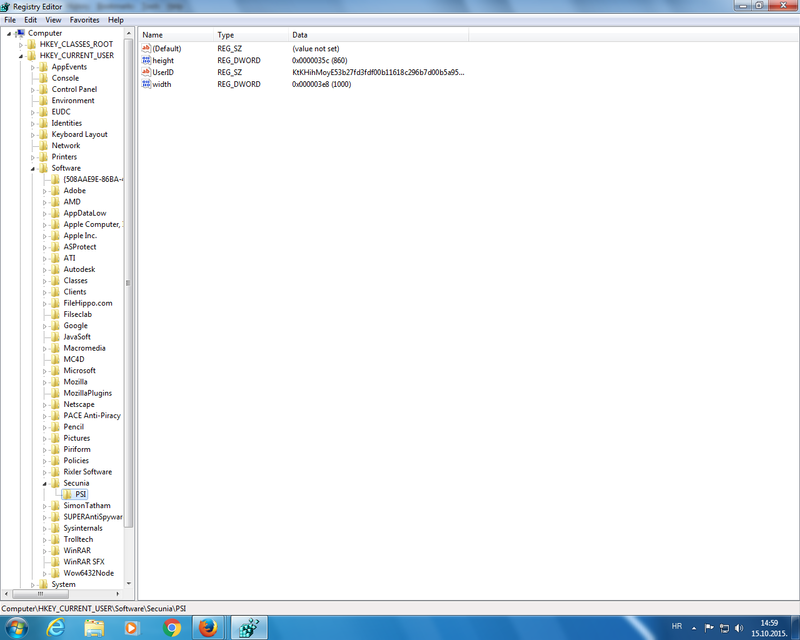 Even though the folder is gone from Program Files, the Setup program says there's an old version of PSI present. However when I tell it to uninstall the old version, nothing happens and I can't get past that point. I have Windows 7 Home Premium 64-bit on the computer. If I understood that you manually removed Secunia PSI from C:\Program Files, there may be a leftover PSI key, in fact entire subtree, in Windows registry. Look for Computer\HKCU\Software\Secunia subtree ... Removing it should make it work, but you will inevitably lose history of past scans within dashboard. Thanks for the reply. I must have a different Windows version than you do though because that tree doesn't show up when I do a search in Regedit. So far searching for just Secunia I'm only finding one line about Secunia PSI Agent. Just as a question at this point,what uninstaller do you think was used? Are you familiar with command prompt? Can't answer about the uninstaller - knowing my Dad he just deleted the files and folders in Program Files. It's been awhile but yes I've used command prompt. P.S. When I said your registry address didn't look familiar, I was referring to the \HKCU\ part. Nothing like that in my registry that I could find. Sorry but I don't understand any of that. What file are you talking about deleting in DOS ? Thanks for the help but I found a way to fix it. Downloaded an uninstaller program and had it look for anything with PSI in it. It found a file and deleted it, along with everything connected to it in the registry. Have PSI installed now successfully. Cool,that's great. Finding a uninstaller program that works would be the way to go. It's why I asked what uninstaller you were using.. Mind if I ask, what one you used? Most persons in the forum use Revo uninstaller. I was going to suggest another. DOS is the same as your hard drive. The file should be indicated as such when utilizing cmd prompt. Another route to go,would be to use an advance search within Windows. Hi Puget, Revo is good indeed. But keep in mind that the free version doesn't show 64bit software. I'm using pro which isn't really expensive. I used revo for along time. I now use another with the ability to do a force uninstall. It really seems to do a better job of cleaning up the registry. Did you understand the bit about the difference between Dos and Windows? Last edited on 14th Oct, 2015 16:47 Hi Puget,In Revo Pro it's possible to use forced uninstall but I can't remember about such option in the free version. DOS? Yes, I'm old enough :) to remember DOS or Disk Operating System. There were at least two versions, from Microsoft, MS DOS, and IBM's PC DOS. After DOS Microsoft came with it's first version of Windows and IBM later followed with OS/2. So I don't see a connection between Windows and DOS. Last edited on 15th Oct, 2015 08:30 "
Hi Leendert. Many thanks for this comment. I use Revo free and you've just explained some of the problems that I've been having. HKCU is just a common abbreviation for HKEY_CURRENT_USER subtree.